DR Dwarkanath Kotnis is still being remembered and loved in China and we shall never forget him for his services, the Chinese President Hu Jintao told the family members of Dr. Kotnis when he met them in Mumbai on November 23, 2006. Kotnis was one of the five Indian physicians dispatched to China to provide medical assistance during the second Sino-Japanese war in 1938. It was during the Japanese invasion of China in 1938 when Communist General Zhu De requested Jawaharlal Nehru to send Indian physicians for providing medical assistance to Chinese soldiers. A medical team of five doctors, including Drs M. Atal, B.K. Basu, M. Cholkar, D. Mukherji and Kotnis was sent as a part of the Indian Medical Mission Team in 1938. Except Kotnis, all others returned safely to India. He remained there to give his services and became an icon in China. He stayed there for four years working in mobile clinics to treat wounded soldiers. In 1939, he joined the Eight Route Army, led by Mao Zedong at the Jin-Cha-Ji border near the Wutai Mountain Area. During his stay, Kotnis provided medical aid to thousands of soldiers and conducted "more than 800 major operations". He was appointed director of the Dr Bethune International Peace Hospital. However, the hardships of suppressed military life finally started to take its toll on him. On December 9, 1942, at the age of just 32 years, he died of epilepsy. 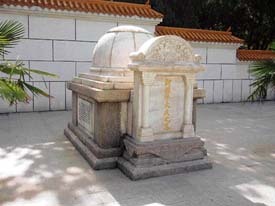 He was buried in the Heroes Courtyard in Nanquan Village. At that time, Mao Zedong mourned his death by observing that "The army has lost a helping hand, the nation has lost a friend. Let us always bear in mind his internationalist spirit." In the Northern Chinese province of Hebei, in Shijiazhuang city, a famous attraction is the Martyr’s Memorial park. The north and south sides of the park are dedicated to the veterans of the Korean and the Japanese wars. 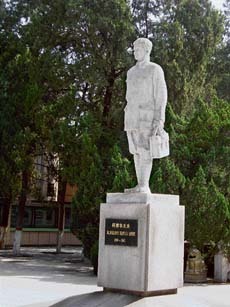 The west side is dedicated to Norman Bethune, a Canadian who fought for the Chinese, and the South side to Dr Kotnis. There is a great statue in his honour. A small museum there has a handbook of vocabulary that Kotnis wrote on his passage from India to China; some of the instruments that the surgeons used in their medical fight for life, and various photos of the doctors, some with the Communist Party of China’s most influential figures, including Mao. Born to Shantaram and Sita on October 10, 1910 in Sholapur, Maharashtra, he had two brothers and five sisters. "He was the second in hierarchy and was lovingly called Baba", said his youngest sister Dr Vatsala Kotnis (79) in a choked voice when she was contacted on phone at her residence at Model House in South Mumbai. He studied medicine at the G.S. Medical College of the University of Bombay in 1930. While in China, Kotnis married a Chinese woman Qinglan Guo. They had a son, Yinhua which means India and China (‘Yin’ means India and ‘Hua’ means China). He died in 1967. However, the sapling of Asoka tree which he and his mother planted during their visit to Dr Kotnis’ hometown Sholapur in 1958 in his memory, still stands tall. He was immortalised in the 1946 V. Shantaram’s movie Dr Kotnis ki Amar Kahani. China too had its own dedication to Dr Kotnis in the 1982 movie Dr D.S. Kotnis. There was also a best-selling biography/novel by K.A. Abbas,And One Did Not Come Back (1945). In 1982, China released two postal stamps on the 40th anniversary of the doctor’s death, and then again in 1992 on the 50th anniversary. In 1993, India also released a stamp depicting his photograph and showing him conducting an operation, in the background. He is such a towering and respected figure in China that when ever any Chinese Premier or President has visited India he has made it a point to visit or send flowers to Dr Kotnis’ relatives. They include the Zhou En Lai in June, 1954, the then President Jiang Zemin in 1996, he sent flowers to his family, the then Premier Li Peng in 2001 and Zhu Rongji in 2002. Recently, on November 23. the President Hu Jintao met his relatives including his two sisters on the last day of his visit to India and while paying rich tributes to Kotnis, describing him as "a bridge between China and India". During the visit, President Jintao presented a large album documenting Dr Kotnis’ life in China, treating soldiers and his meeting with Mao. "We have presented the President a video of 1946 Hindi Film of V. Shantaram’s Dr Kotnis Ki Amar Kahanis and his biography Bridge Forever, written by Mangesh Kotnis, his elder brother and a cotton bedsheet, made in Solapur", said Vatsala Kotnis, who has studied acupuncture at the Bethune hospital in Shijiazhuang in the early 1980s and started an acupuncture clinic in India which she still runs. "Though our beloved brother always lives in our hearts but with such visits by Chinese Premiers his memories are refreshed. We really feel honoured that our brother is so respectfully remembered in China because of his dedication towards his work for saving or treating Chinese soldiers during the aggression", said the proud sister. However, she said that she is missing her sister-in-law Guo Qinglan, 91, who was to visit India along with President Jintao for the sixth time but could not due to bad health. On December 9, 2006 when Dr Kotnis was remembered by both the nations on his 64th death anniversary for his yeoman’s service to humanity. imbibe his morals for making this world a place to live with peace and harmony and work selflessly for the betterment of humankind. "This would be a real tribute to him", saidVatsala.